A paint is any pigmented liquid, liquifible, or mastic composition designed for application to a substrate in a thin film which is converted to an opaque solid film after application. As Modelers, what do we use it for? • Binders that hold the pigment particles together and provide adhesion. The SOLIDS part is composed of the binder, pigments, and additives. The LIQUID part can be water, in the case of WarbirdColors, or mineral spirits or some other solvent in the case of oil-based paints. The “solids” part are those ingredients that remain in the dry film coating which adheres to the substrate. The liquids evaporate or “flash-off” as the paint dries, thus are not present in the dry film coating. So, since the solids comprise what we ultimately perceive as paint, they are particulary important in the performance of the coating. Since the mid 70’s paints have not contained lead. Lead was used as a hiding pigment. Today the lead has been replaced with titanium dioxide (TiO2). As a result, some colors are more difficult to obtain the hiding property that may have been prevelant in lead-based coatings. Binders in solvent-based coatings are classified as either natural or synthetic. Binders in water-based coatings are synthetic, with the two most popular being “acrylic” (100% acrylic), and “vinyl-acrylic” (also called “polyvinyl acetate/acrylic) or “PVA”. The binders in WarbirdColors are acrylic. A major part of paint quality is related to how much solids are in the paint. Remember that the solids are the components of the coating that remain on the substrate after the liquids have evaporated or “flashed-off”. Compared to a low-solids paint, a higher solids paint will dry to a thicker film, which results in better hiding and protection of the substrate. Some paints will have on their labels or spec sheets such descriptions as “40% solids”. WarbirdColors is a high-solids coating consisting of 47% solids by weight and 35% by volume. So, now we know that the solids part of paint is the important part and that everything else “goes-away” What are those solids? Pigments are finely ground natural or synthetic Insoluable materials, organic or inorganic, supplied as highly concentrated liquids called colorant. In addition to color, pigments have an impact on other properties such as opacity, hardness, and durability. The term pigment is also used to include “extenders”. Extenders are materials like clay, talc, mica, and silica that add bulk to the paint without detracting too much from the properties of the paint. The “whiteness” in paints is generally obtained from the pigment, Titanium Dioxide. It is an expensive , high-hiding pigment. High quality and light colored paints have high levels of TIO2, up to three(3) pounds per gallon. 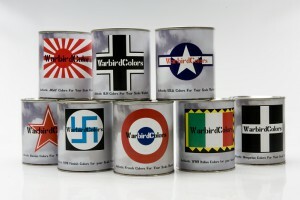 WarbirdColors contains approximately 2.0 pounds per gallon, depending upon which of three bases is used as a starting point. The starting base is determined by what the final color will be. The lighter the color, the more “white” is needed thus more Titanium Dioxide. Most paints contain several pigments as well as extenders. Because pigments are solid particles, i.e. powder , (particles in suspension in colorant), they need to be “bound” together in the paint film, and the film needs to be provided with adhesion to the surface being coated. This is what the binder does. In general terms, the binder is a resinous material that surrounds the particles of pigment. When the paint dries, the binder forms the tough, continuous film that will adhere tenaciously to the surface which it is applied. A paint with little or no binder will perform poorly. Think of “whitewash”. The type and level of binder has a dramatic impact on the properties of the paint, including gloss, color retention, flexibility, and others. The liquids in paint serve several purposes. They keep the pigments dispersed and the binder either dispersed or dissolved in an easy-to-apply fluid state. The liquids evaporate or “flash-off” and are said to be “volitate”. The drying characteristics of the types and levels of liquids used will determine the paints dry-time properties. Additives are combined with the primary ingredients to improve the performance of the coating. They may thicken or thin the coating, reduce or increase the gloss, and promote adhesion. Paint formulators use a concept called “Pigment Volume Concentration” or PVC to vary the properties of paint. PVC is the ratio of pigment, in terms of volume, to the total volume of pigment and binder solids. (total non-volitate volume) in the paint. The ratio is a percentage. Low PVC paints in the 10% – 22% range, have a low ratio, generally associated with a glossy finish. Conversely, high PVC paints in the 45% – 75% range are loaded with pigment compared to binder resulting in a very flat finish. Another way to look at PVC as a concept is to think about how much binder is available to surround the pigment. Low PVC paints have more binder, resulting in a smooth surface like a semi-gloss or high-gloss paint. In high PVC paints there is not enough binder to cover the pigment, resulting in a rough texture surface that has a flat finish. Low PVC paints, because they are “binder rich”, tend to adhere better and last longer than high PVC paints. WarbirdColors are in the lower 21-22% range for PVC. How paint dries differs between oil-based paints and water-based paints. Solvent or oil-based paint dries and cures in a 2-stage process. First the solvents evaporate, leaving just the film of solids on the substrate. At the same time, the second stage is under way. The oil, or alkyd binder begins to oxidize or cure. This process usually takes a day or more. This oxidation of the binder can, in some cases, continue indefinitely and in some cases result in yellowing and excessive hardness which can result in a tendency to crack and chip. Water-based paints like WarbirdColors are made with binders that are dispersions of solid particles of synthetic resins in water. As the water evaporates and the paint begins to dry, the binder particles come closer and closer together. Ultimately they fuse together, entrapping the pigment particles and forming a tough, water resistant continuous film. This fusing is called coalescence. No further oxidation or curing occurs that could further harden the paint. The drying process can be affected by ambient temperature. If applied in too low of temperature, the binder particles will be too hard to fuse completely. If applied under conditions that cause it to dry too quickly, the particles will not have enough time to coalesce and form a continuous durable film. Paint fades, we all know that. Direct sunlight can degrade the binder and pigment, resulting in chalking, erosion, and color loss. The lower the quality of paint, the more rapid the breakdown. Water-based binders tend to resist the effect of direct sunlight better than those of oil-based paints. Water-based binders tend to be transparent to UV radiation while oil and alkyd binders actually absorb the radiation, thus breaking down more rapidly. Additionally, certain colors are especially vulnerable to fading caused by UV radiation. For those of us who model warbirds, you don’t have to look very far to see examples of aircraft that aren’t exactly the color we think they should be, or that we have been told that they were. Why? • The paints were oil-based and thus more vulnerable to UV radiation and fading. • Cheap Paint! These aircraft had a life-cycle of weeks or months, rarely years, so they weren’t covered with a top quality paint. Pacific theater aircraft were exposed to more sunlight, and much more intense sunlight that those of the European theater and thus faded quickly. And as we all know, as the war progressed, raw materials were in short supply especially for the Axis Powers. The quality of any paint job, regardless of what the paint is or the quality of the paint, is directly related to the quality of the surface preparation. If the surface prep is poor, the paint job will fail, regardless of the quality of the paint utilized. • The surface needs to be, first of all, CLEAN. Free of all contaminates such as dirt, oil, dust, grease etc. etc. • The surface needs to be smooth, not all rough and irregular. However, the surface cannot be too smooth.